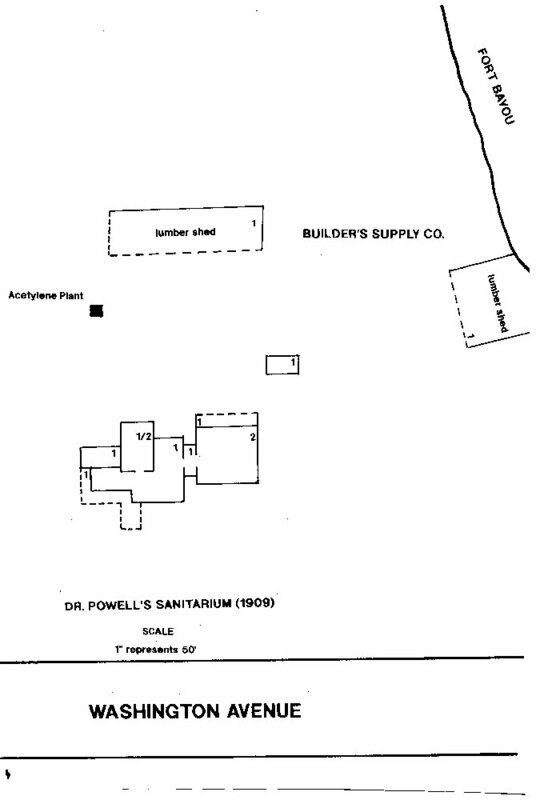 Dr. Powell's Sanitarium (later Bayou Inn and Bayou Chateau)) was located on the south bank of Fort Bayou at Washington Avenue in Lot 9, Block 52 of the Culmseig Map (1854). It was in proximity to a free flowing spring which provided mineral water to its patrons. The original structure was probably the old Antonio Franco home place which may have consisted of a one to one and a half story, pier supported, wood framed structure of approximately 2400 square feet. In 1909, Dr. Powell constructed a two story, 2660 square-foot connecting addition north of the old house. Their were two galleries (east and west facing) totaling 750 square feet in area. In 1874, Antonio Franco (1834-1891), a Portuguese immigrant, and his wife, Genevieve "Jane" Rodriguez (1844-1915), daughter of Spanish immigrant, Juan Antonio Rodrigues, settled in the NE/4 of the SW/4 of Section 19, T7S-R8W. Here on the south bank of Fort Bayou, Franco ran a ferry across the bayou linking the people of Ocean Springs with their brethren to the north. He also operated a saloon on Washington Avenue which later became George Arndt's Paragon Saloon. The Francos reared a family consisting of: Charlotte F. Cochran (1864-1939), John J. Franco (1859-1935), Lillie F. Geiger (1863-1905), Joanna F. Ruppel (1865-1903), Thomas Franco (1869-1951+), Francis Aristede Franco (1871-1935), Eugenia Franco (1875-1950), Anthony Franco (1878-1939+), and Walter Edward Franco (1883-1939+). In 1906, at this lovely three acre site overlooking historic Fort Bayou, Powell established a sanitarium utilizing the curative powers of the Indian Springs just west of his lodge. The Pascagoula Democrat-Star of November 24, 1905 (Ocean Springs Locals) related the following: There is no longer any impedimenta in the way of Dr. Henry Bradford Powell building a sanitarium which has long been projected. This is a movement in the right direction as an institution of this kind will supply a long felt want. Our exceedingly healthy climate and the accessibility of our Coast to Chicago and a large belt of surrounding country renders this place a suitable site, while the eminence of Dr. Powell at the head will be an unlimited source of confidence to its patrons. Mrs. Powell, probably the widow of Curtis Rudd of Chicago, had discovered Ocean Springs in the late 1880s as she owned real estate along Ward Avenue (Alto Park Block 3) and possibly the front beach. She had met Dr. Powell at Chicago where he practiced medicine. Powell was a native of Whitby, Ontario, and a graduate of Pickering College and the University of Toronto. He had done post-graduate work in surgery at Berlin and Vienna. The Powells appear to have visited Ocean Springs often in the 1890s probably wintering here like many others from the Midwest. The Pascagoula Democrat-Star of February 3, 1899 announced "Dr. H.B. Powell and Mrs. Powell all of Chicago are domiciled at their seaside home, Three Oaks". They owned a home at Chicago where Mrs. Powell's mother, Caroline Phillips, resided. She also had a sister, Mrs. H.W. Toby, of Enderlin, North Dakota. The Powells were still residents of Chicago in 1900 as a local journal reported that "Dr. and Mrs. H.B. Powell after a delightful sojourn at their beautiful home here returned to their Chicago home". In February 1901, H.B. Powell permanently located at Ocean Springs. He set up his surgical and medical practice with dispensary in the Masonic Building. He also entered into a lease agreement with F.J. Lundy (1863-1912) for the Ocean Springs Hotel the same year. Dr. Powell and F.J. Lundy must have become good friends. The Powells had met Mignon Courson (1878-1957), a charming and talented, Iowan born violinist, in Chicago. They invited her to Ocean Springs. Here she met the widower, Lundy who had lost his wife, Vera Poitevent (1874-1897), in 1897. Mobile born, Lundy was a very successful merchant, and the father of a daughter, Virginia May (b. 1893). F.J. Lundy married Mignon Courson in 1901. They had a daughter, Margaret, who born in 1903. After Lundy's death, Mignon Lundy moved to London. She settled at Townshend, Vermont where she died in 1957. The summer of 1904 saw Dr. Powell travelling and study ing in Europe. He visited London, Heidelberg, and Berlin. At Berlin, Powell spent weeks at the hospitals and University observing the latest surgical techniques. Upon his return in the fall, he intended to manage the Ocean Springs Hotel. It can be established with some degree of certitude that the Powells were permanently settled at Ocean Springs in 1905, as Dr. Powell was issued a license to practice medicine on November 17, 1905 in Jackson County. By 1906, Dr. Powell was driving the first automobile in Ocean Springs on the shell roads of town. He must have created much ex-citement as he motored from his residence at "Three Oaks" on the beach to his sanitarium at Fort Bayou.. In January 1909, Powell's sanitarium was doing well with patients coming from all over the Midwest and east. This flurry of prosperity encouraged the Powells to build a two-story addition on the north side of the old structure of approximately 2600 square feet. A modern heating plant, and other conveniences to please his patients were installed at this time. The firm of Burr & Bradford were the contractors. Upon completion of Dr. Powell's work, they built the First Baptist Church at Porter and Bellande. By August, the grounds were landscaped with green hedges and tropical foliage flanking the walks and driveways. The spa was frequented daily by hundreds to imbibe the salubrious mineral waters. They claimed the springs benefited them. When the new Ocean Springs State Bank building was opened in early 1910, Dr. Powell maintained an office on the second floor. About this time, he became interested in establishing a golf club at Ocean Springs. Arrangement were made to layout a seven hole course on Captain Antoine Bellande's tract (formerly Ames) where the ball park was once located. By July 1910, a four hole course was operating on the ball ground. In addition to his professional services as a doctor and sanitarium proprietor, Powell was active in civic and social functions. When the Ocean Springs Civic Federation and the L&N Railroad constructed Marshall Park in 1911, the work was supervised by a commission composed of J.H. Behrens, Theo Bechtel, and Dr. Powell. Dr. Powell maintained his avid interest in golf, and with A.E. Lee and George E. Arndt, he organized the Ocean Springs Country Club in April 1914. The country club and golf links were located on sixty five acres of land leased from the Rose Farm north of Ocean Springs. By May of 1914, Dr. Powell who was the president of the Ocean Springs Country Club saw the course enlarged from five to nine holes. The course was in good condition as Mrs. D.V. Purington had donated a horse lawn mower to the club. The putting greens were kept oiled to insure a solid surface. Members aspired for eighteen holes by the end of the year. By January 1917, the Bayou Inn Cup was established at the Ocean Springs Country Club. Druggist, John Whittle, won the match play contest held over several weekends of links play. The trophy cup was displayed at his drug store in the Catchot Building on Washington Avenue. In March 1917, the Powells sold "Three Oaks" and moved to "Hillside", the Calogne Cottage at 204 Washington Avenue. By the summer they were renting the McVay home (now Conamore) on Lovers Lane. In 1917, Dr. Powell hired H.G. Ganson to manage the Bayou Inn. Ganson spent that summer at Pointe-aux-Pins, Michigan to take care of his hotel interest there. He was expected back at Ocean Springs in October since Dr. Powell would enlist in the US Army on October 2, 1917 for World War I. H.G. Ganson left Ocean Springs for Johnson City, Tennessee in February 1918, where he would manage a hotel there. During the early stages of the Great War, Powell was stationed at Camp Shelby with the 139th Field Artillery. He saw active duty in France as the war was ending. Powell was with the Army of Occupation in Trier, Germany where he performed surgical work. Dr. Henry Bradford Powell returned from his military exploits on October 31, 1919 attaining the rank of Captain although he was often referred to as Major Powell. Mrs. L.D. Davenport, the sister of nationally known baseball writer, Charlie Dryden (1869-1931), was in charge of the Bayou Inn during Captain Powell's absence. When Dr. Powell got back into civilian life at Ocean Springs, his medical office was located at the Bayou Inn. Like most hotel and inns at Ocean Springs, a fire was expected at any time due to the nature of the wood construction. Fortunately in April 1927, the Bayou Inn escaped with only minor damage when a fire was discovered on the roof. The fire company extinguished the blaze very quickly. Mrs. Powell visited her mother in Chicago during the hot month of July. The Powells also had a farm north of Fontainebleau. In February 1928, the Dixie Oil Company of Shreveport, Louisiana was doing seismic, oil exploration work on this parcel east of Ocean Springs. By 1929, Mrs. Powell's mother had moved to Lawton, Michigan where they visited with her in August. Later they drove to Toronto to call on friends there. After a long life filled with human and military service, entrepreneurial exploits, and social and civic duties, Dr. Henry Bradford Powell died on Government Street in May 1949. He was buried in the National Cemetery at Biloxi. Mrs. Powell lived until December 1969. She died at Miami while residing with her son, Numa F. Theriot (1914-2002). Mildred Powell is interred at the Evergreen Cemetery at Ocean Springs. Mrs. Logan apparently maintained the Bayou Inn as a residence as her daughter, Mrs. George Kalmbach of Shreveport, Louisiana would visit her on occasions. When these visits were reported in the Jackson County Times, her property was referred to as their Fort Bayou estate or Mrs. Logan's place, the former Bayou Inn. Adrian, daughter, of Mrs. Kalmbach. Obviously all was not well at the Shafer establishment for in August 1947, Mr. Shafer, a retired lawyer from Memphis. Attempted to take his own life by firing three bullets into his stomach. The name, Le Moyne Lodge, was probably chosen, as it was the family name of Iberville (1661-1706) and Bienville (1680-1768), the French Canadian brothers from Montreal, who established Fort Maurepas (1699-1702) at present day Ocean Springs, in April 1699. The fourteen refurbished rooms were named for the Confederate States who ceded from the Union in 1861. Mrs. C.B. Smith also instituted the “Julep Room”, which remains today. After leaving the pastoral serenity of east Ocean Springs, the Smith family rented a house on the east side ofSunset, formerly Cemetery Road, and the entrance into the Evergreen Cemetery. David Earl Mattina was a native of Biloxi, and an outstanding football and baseball player at Biloxi High School in the late 1920s. He won an athletic scholarship to Spring Hill College at Mobile. Mattina also owned the Globe News Stand on Howard Avenue at Biloxi in the late 1950s and 1960s. At Ocean Springs, he operated the Fort Bayou property as the LeMoyne Lodge. Several rooms were utilized to exhibit handicrafts and hand-blown glass. One room was reserved for art instruction by LaVigne Long of Gulf Hills. An amphitheater was planned on the grounds west of the main structure amid the live oaks. Outdoor concerts and musicals were planned for this erection. The basement area once occupied by Trilby's Restaurant, operated by Trilby G. Steimer (1896-1960), and the Julep Room were refurbished to present a brick-walled English tavern ambience. This tavern known as King William's Cellar featured colorful red and black chairs with gold crests on their backs. A fireplace completed the tavern atmosphere. King William's Cellar opened on February 1, 1969 with internationally acclaimed opera singer, Lillian Rappolo, and "2-90" Durham, the World's Greatest ragtime pianist, as the featured entertainment. Rapollo came direct from the Persian Room of New York's Plaza Hotel. By 1972, King William's Cellar had develop a fine reputation for its beef fondue, roast prime rib, fish fondue, rolled cabbage, and hickory smoked ribs. Other unique features at this time were the autograph wall extending the length of the east side of the Cellar, the "Enchanted Tunnel" which connected the Cellar to the first floor dining area, and the one hundred-year-old Steinway grand piano. Two small buildings, the 1911 Marshall Park Bandstand and an old carriage house, graced the property. After a renovation, Lizana opened a restaurant called, AUNT JENNY'S CATFISH RESTAURANT, in October 1981. The eatery which specializes in fried catfish is capitalizing on Mississippi's growing catfish farming industry. In early March 1989, Lizana donated the old bandstand to HOSA who moved it to Marshall Park and restored it under the supervision of architect, Bruce Tolar. The present establishment appears to be a financial success. Ray L. Bellande, "Lundy Family", (unpublished essay), October 1992. Biloxi, Mississippi City Directory (1961), Volume 6, (Mullin-Kille of Texas: Chillicothe, Ohio), p. 57. Regina Hines Ellison, Ocean Springs 1892 , 2nd Edition, (Lewis Printing Services: Pascagoula - 1991), pp. 93-94. Harriet White Frank, Burial Records: Biloxi National Cemetery, "H.B. Powell", (White: Biloxi - 1992). Jerome Lepre, Catholic Church Records Diocese of Biloxi, Mississippi (1843-1900), "Franco", (Catholic Dioceses of Biloxi: Biloxi -1991), p. 123. The History of Jackson County, Mississippi, "Henry Bradford Powell", (Jackson County Genealogical Society: Pascagoula-1989), p. 320. Mississippi Coast History and Genealogical Society, "Postmasters", Volume 13, No. 1, (June 1977), pp. 22-23. WPA For Mississippi Historical Data-Jackson County, Addenda, (State Wide Historical Project, 1936-1937), p. 25. Physicians License Book 1, Jackson County Circuit Court, Jackson County, Mississippi, p. 95. Down South, "Bayou Chateau", Volume 22, No. 2 (March-April 1972), pp. 4, 5, and 21. The Daily Herald, "State Football Champions to Cast Eye on Pigskin", August 23, 1927, p. 9, cc. 4-5. The Daily Herald, “Ocean Springs”, December 22, 1932. The Daily Herald, “Dr. H.B. Powell Obit”, May 30, 1949, p. 7, c. 3. The Daily Herald, “Ocean Springs Graduates”, June 13, 1950. The Daily Herald, "Landmark Gets Facelift and New Name", October 21, 1981. The Daily Herald, “Mineral springs made Ocean Springs famous”, November 29, 1974. The Daily Herald, “David Earl Mattina Obit”, January 27, 1989, p. A-4. The Gulf Coast Times, "Le Moyne Lodge Will Open This Weekend", September 3, 1953, p. 1. The Jackson County Times, “Local and Personal”, November 25, 1916. The Jackson County Times, "Golfers to play for Bayou Inn Cup", January 26, 1917, p. 1. The Jackson County Times, “Local News Items”, February 3, 1917. The Jackson County Times, “Local News Items”, February 24, 1917. The Jackson County Times, “Local News Items”, March 31, 1917. The Jackson County Times, “Local News Items”, May 26, 1917. The Jackson County Times, “Local News Items”, February 23, 1918. The Jackson County Times,, “Local News Items”, February 1, 1919. The Jackson County Times,, “Local News Items”, April 19, 1919. The Jackson County Times, “, Local News Items”, November 8, 1919. The Jackson County Times,, “Local News Items”, November 22, 1919. The Jackson County Times, “Local and Personal”, September 26, 1925. The Jackson County Times, “Local and Personal”, April 23, 1927. The Jackson County Times, “Local and Personal”, July 16, 1927. The Jackson County Times, “Local and Personal”, January 28, 1928. The Jackson County Times, “Local and Personal”, September 23, 1936. The Jackson County Times, “Bayou Chateau Advertisement”, October 28, 1944, p. 4. The Jackson County Times,"Shafer Attempts Suicide", August 2, 1947, p. 1. The Ocean Springs News, January 23, 1909, p. 5. The Ocean Springs News, February 13, 1909, p. 1. The Ocean Springs News, August 28, 1909, p. 5. The Ocean Springs News, "Local News", October 9, 1909. The Ocean Springs News, "Local News", November 6, 1909. The Ocean Springs News, January 22, 1910, p. 5. The Ocean Springs News, June 17, 1911. The Ocean Springs News, "Local News", February 21, 1914. The Ocean Springs News, "Local News", April 4, 1914. The Ocean Springs News, "Local News", May 2, 1914. The Ocean Springs News, "$600 Available: Country Club Extends Links", May 13, 1914, p. 1. The Ocean Springs News, "Powell Wins Trophy", December 31, 1914, p. 1. The Ocean Springs News, "Ocean Springs Has a Great Future, Says Manager of Chicago Association Commission", March 4, 1915, p.1. The Ocean Springs News, “New Citrus Fruit, Originated in Ocean Springs, Promises Well”, March 25, 1915. The Ocean Springs News, "Local News", June 3, 1915. The Ocean Springs News The Ocean Springs News , "Country Club Elects Officers", July 15, 1915, p. 1. The Ocean Springs Record, "Bayou Chateau Plans of Dr. and Mrs. King", December 5, 1968, p. 9. The Ocean Springs Record, "Advertisement for King William's Cellar", January 30, 1969, p. 3. The Ocean Springs Record, "King William's Cellar Holds Gala Opening", February 6, 1969, p. 1. The Ocean Springs Record, "Moving Day", March 9, 1989, p. 1. The Pascagoula Democrat-Star, February 3, 1899. The Pascagoula Democrat-Star, May 4, 1900. The Pascagoula Democrat-Star, November 30, 1900. The Pascagoula Democrat-Star, February 15, 1901. The Pascagoula Democrat-Star, “Ocean Springs Locals”, November 24, 1905. The Pascagoula Democrat-Star, April 6, 1906. The Pascagoula Democrat-Star, April 13, 1906. The Progress, “Local News Items”, May 28, 1904. Sanborn Map Company (New York), "Ocean Springs, Mississippi", (1909)-Sheet 1. Courtesy of Katherine Hamilton-Smith, Curator Special Collections, at the Curt Teich Postcard Archives, Wauconda, Illinois. US Census-Jackson County, Mississippi (1880, 1900, 1910, and 1920). J.K. Lemon - December 1992. Carl Lizana - June 1993. Catchings Baird Smith, Jackson, Mississippi-Febraury 2005. George Faison Smith, Jackson, Mississippi-February 2005.